It's entirely possible that I've just competed in Ireland for the very last time, unless the whole France thing doesn't work out and we come back next year with our tails between our legs. I'm sad about that, but otherwise I couldn't be happier about today. It started at 6.40am, when I hauled a fat, contented Flurry in from the paddock with really long grass, which he had broken into overnight. No feed for him, then, the little glutton. I washed his mane, tail and fetlocks, sprayed his tail with loads of Mane&Tail conditioner, plaited his mane and spent AGES going through his tail, but it was worth it, it looked gorgeous afterwards. I gave him a small amount of haylage to keep him happy while I went in for my brekkie - well, I couldn't let the poor little guy get hungry, could I? We arrived at our show venue, Maryville, in good time, tacked both of us up and headed to the warm-up. Flurry didn't feel great warming up, it was busier than he's used to and he was a bit intimidated by the other horses. He was also lazy and a bit inattentive, so I was doing transitions and leg-yielding to try to sharpen him up, but I still wasn't too happy with him when we were called up for our first test, BD Prelim 12. 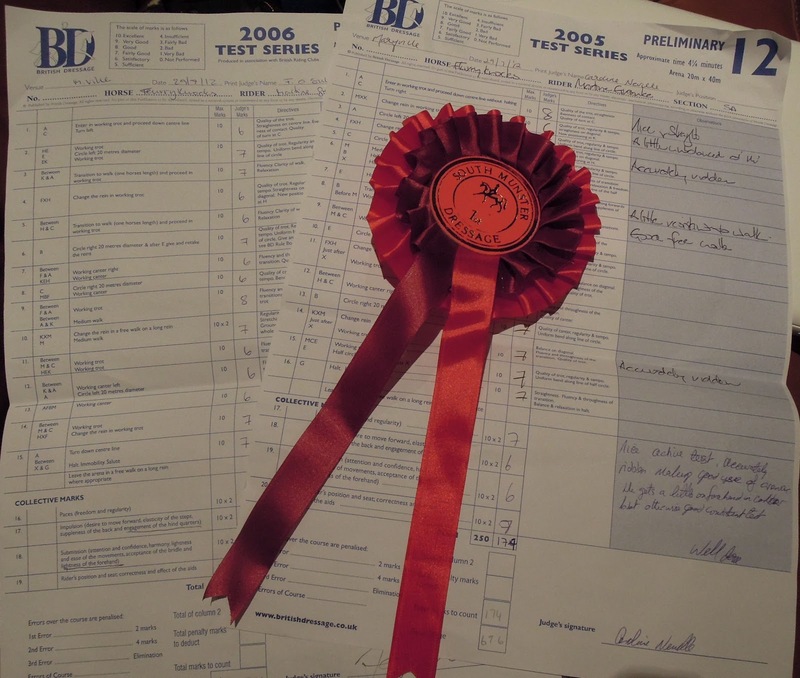 I was astounded when I saw my score - 69.6%, the third highest score in all of test 12, and the winning score in my section! 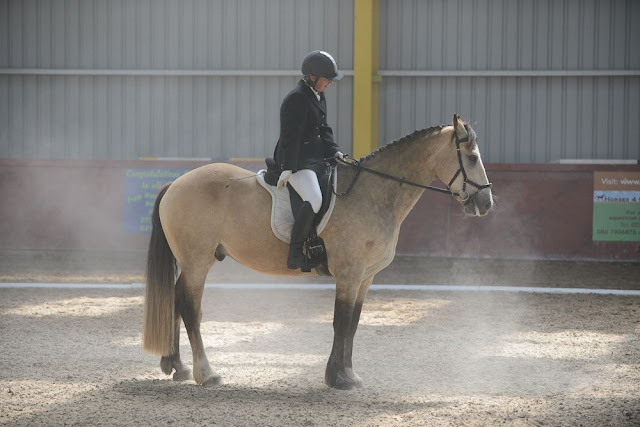 The judge's comments were "Nice active test, accurately ridden making good use of arena. 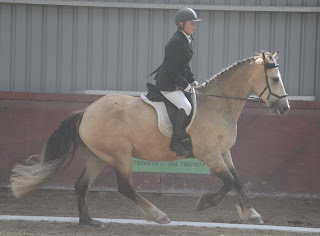 He gets a little on forehand in canter but otherwise good consistent test." Woohoo! I had a quick look at the video afterwards, and I have to say, it looks better than it felt! 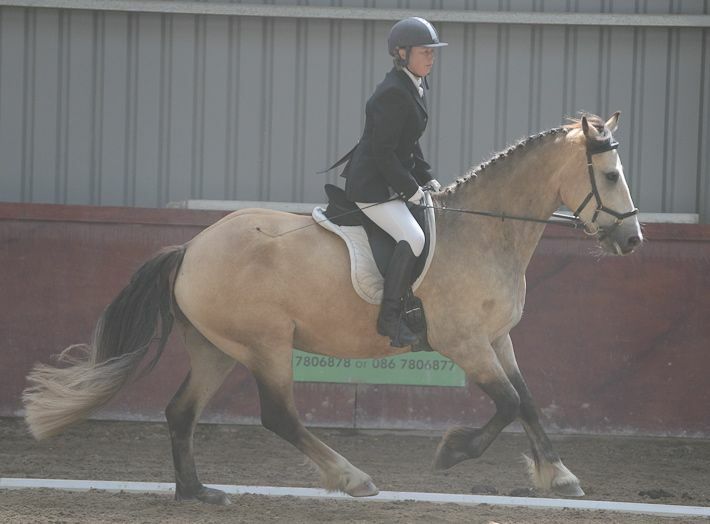 Yeah, the canter still isn't great, I think the judge was a wee bit kind to me, but the trot work looked good throughout. I was determined to improve the impulsion for the next test, BD Prelim 14, but at the same time I didn't want to overcook him in the warm-up, so I carefully allowed 25 minutes to tack up and warm up again. When we arrived back at the trailer, though, we found he had covered his formerly lovely tail with liquid, grassy poop - yuck! There was nothing I could do except shake most of it off and hope the rest would fall off during our warm-up! 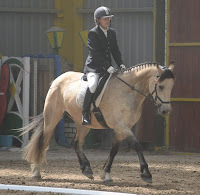 He was more attentive in the warm-up and we worked on transitions again, still trying to get more impulsion going. I went back into the indoor feeling positive initially, but I felt like I was booting him around and the test just didn't flow as well as the first one. The good news, though, was that the poop seemed to have fallen out of his tail! This time there was no video, the LSH was taking stills instead, and having seen them, I have to say it doesn't seem to have been as good as the first test. In looking for more impulsion, I lost consistency in his outline and the transitions did not flow as smoothly. The score? 64.58%, still a score to be proud of as far as I'm concerned, and once again, the winning score in my section. The judge's comments this time were "Overall calm, obedient test. 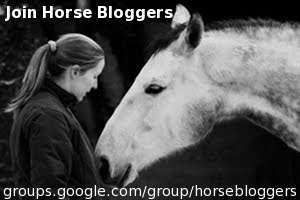 Needs to be more active in trot work and lighter on forehand in canter." Yes. I agree with all that. So since completing our 500km trek across France, Flurry and I have competed twice in dressage and have managed to score over 63% on each occasion. What's so special about 63%? That's the qualifying mark for our National Championships - we're now qualified for the Sportsmans A finals (an amateur section), but the bad news is I probably won't be able to go - we've just got too much to do before we leave for France. Oh well, at least we qualified. 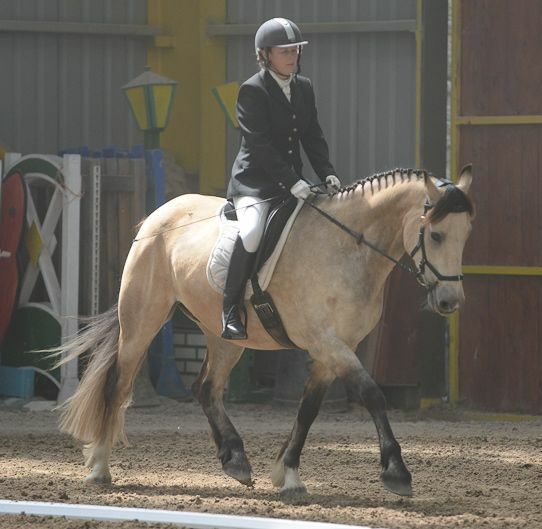 I'm very proud of my little horse! Well done to both of you what a great result. Great job! Both you and Flurry look amazing! Thanks, Allie, looking at the video I can see I need to lengthen my stirrups and shorten my reins, but like I said before, I can "see" it but I can't quite "do" it! He looks gorgeous :) Well done!! Flurry looks absolutely stunning! Congratulations on a really beautiful ride. That is an amazing score! You two make a great team. Love the way you work together. Congratulations on your ride and the wonderful scores. Who knows maybe you can fit in the Sportsman A Finals and if not it's a nice feeling to know that you qualified! Thanks, GHM, we've really become a team since last year! Hi there! 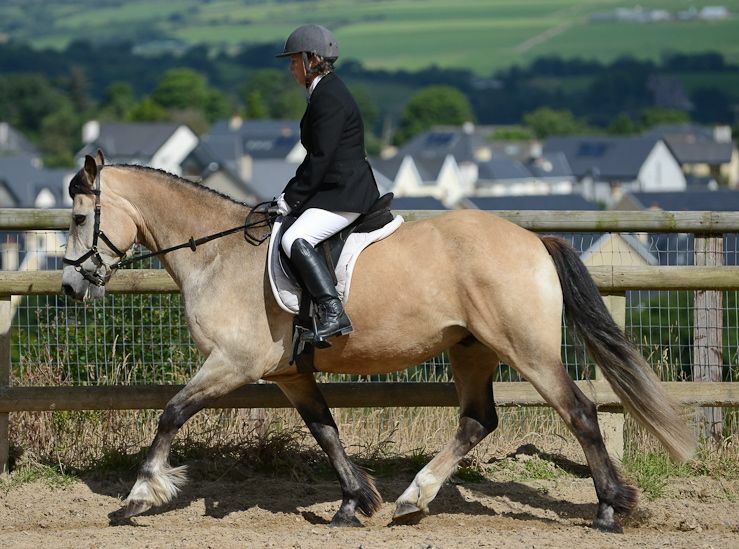 Is that a Welsh Cob you're riding? 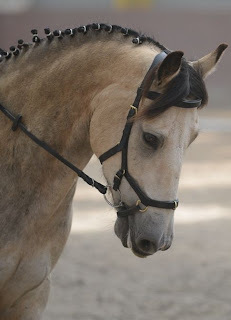 Great looking horse! Hi Jen, no, his breeding is not recorded but we think he is an Irish Cob/Connemara cross. I'm pretty sure his Mom was piebald, he gets excited and calls every time he sees a piebald horse! Aww! He's cute, and looks like a great mover. How do you like your Micklem? I'm considering saving my pennies for one.